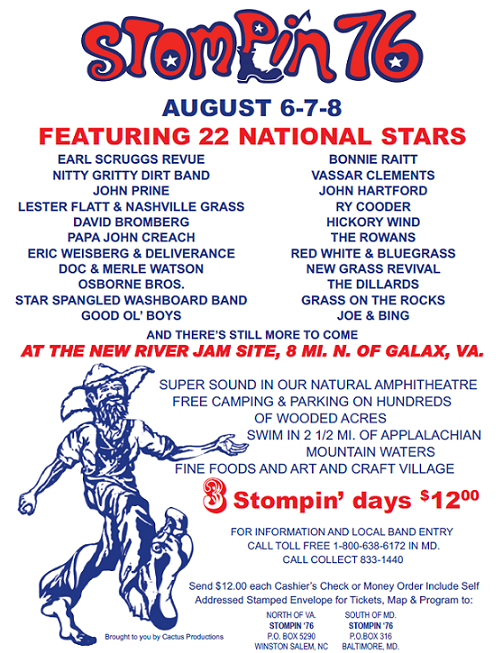 Welcome to the Official web site of Stompin 76, the legendary Bluegrass Music Festival held in the summer of the bicentennial year, North of the Bluegrass Capitol, Galax, VA, USA. This one-time event was the biggest bluegrass music festival on record. 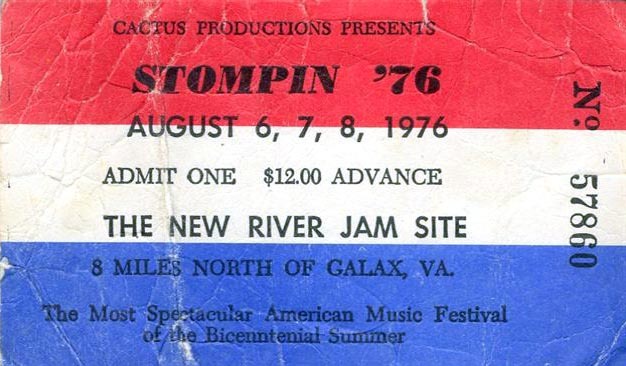 The star-studded bluegrass/ blues lineup, combined with a city's worth of bluegrass music and festival lovers, a low ticket price and historic marketing campaign, made Stompin 76 the place to be August 6,7,8 1976. The promoter was 21 yr. old Hal Davidson from Baltimore Co, Maryland, USA. Many attendees and their decedents still talk about wild experiences forging close relationships lasting a lifetime. Bluegrass did it! 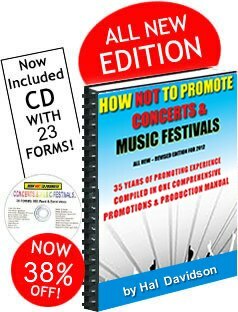 The huge promotion brought festival goers together from all over the eastern, US. The people, the bands and that natural place, made this bluegrass festival not like any other bluegrass music festival before or after. 3 Days of Fun and Music, all 23 bands for only $12.00! 2 for $15 FREE SHIPPING! Vinyl UV coated Bumper Sticker 11" x 3"
Shipped USPS Mail within 48 hours. Promoted from February - August 5 1976 by Hal's Cactus Productions, Inc. of Las Vegas. 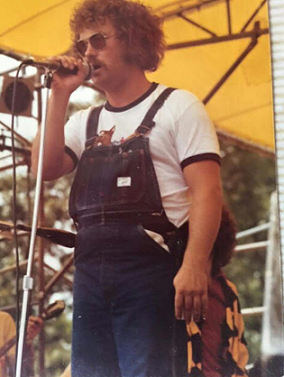 Hal founded Cactus Productions the year before in 1975 (at age 20) with the intention to start promoting concerts back in Baltimore, where he was from with his young friends. Besides Las Vegas, he based 2 of the 3 Stompin offices in Owings Mills, MD. The other office was in Winston Salem, NC. $12 for a three day festival; no wonder I could afford it then. Unbelievable and I was there. 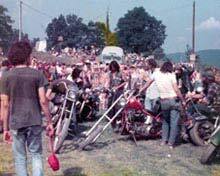 The festival that stands out above the rest was Stompin 76. Wow! I traveled there with 3 friends from NJ in a VW van, of course. We got there late at night. I remember seeing all the Pagans when we pulled into the grounds. We got stuck on the road close to the river and that is where we wound up camping. Not only was the music line up fantastic but since my boyfriend was a musician, I listened to many great jam sessions. I'm glad I have the opportunity, 42 years later, to thank you for putting together Stompin' 76. Although the craziness and party atmosphere certainly have their places in my memories, above all else was the great music. My friends and I saw nearly every minute of every act, leaving the stage area just long enough to scarf down some food and fill up the coolers. We were amazed that you were able to get all the musicians in and out of there. I was there.One of the best times of my life.My only regret is that I didn't get to see every performer there.Wasn't sufficiently medicated,I guess.Thanks for the memories.Hope to get the "t-shirt".All the best! What an epic weekend this must have been. I was too young to go with my Dad, but he gave me some pictures. He snapped this one I wanted to share with you. Man, what memories. I was there all three, maybe four days. Grew up in southwest VA and went to many music festivals in the 70s, including Union Grove many times. Stompin 76 was by far the best. That festival was unbelievable. I spent most of my time watching the music and wondering around from camp to camp meeting new folks. The music was fantastic and the setting priceless. Thank you so much for putting that event together and I am sorry it was so hard on you Hal. With greatness comes a price. Doug. Thanks to the throngs of wild, adventurous people who make the trek to Stompin 76, all of you who are still alive, and those of you who contacted me over the past years since the internet emerged. Thanks for all of the contributions to the Facebook page as well. It's good we've finally rejoined virtually! It's great to hear your stories after all of these years. Now with facebook's new group: "I was there at Stompin 76" the legend continues and is growing. The web has provided us with a virtual gathering farm once more. Those raw days back then, we were all so young, so carefree. 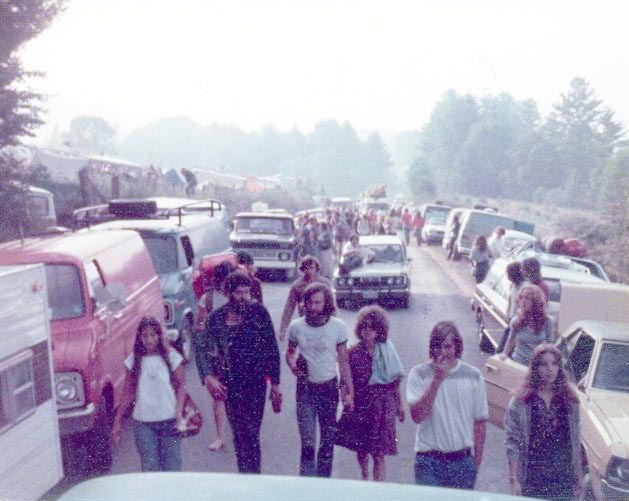 Stompin was the biggest party that year and in retrospect one of the biggest outdoor camping festivals in modern American music history. You were all parking and camping all over that poor county (Carroll). The State Police Commandant flew in on his helicopter just to let me know that my customers were parking on his interstate 11 miles away and walking in. He wanted to know what I was going to do about it. I didn't have a good answer so he left. This is to commemorate that classic bluegrass festival, the people that ventured there, and to stir the spirit once more so that those vivid (or blurred) memories of Stompin 76 linger for many, many years to come! For 3 days in August 1976, 8 mi. north of Galax, Va., on Lawson's Farm, we called the New River Jam Site, just a stone's throw from the North Carolina border, bluegrass and blues abounded. Outdoor Music festival lovers from all parts gathered for that historic event. 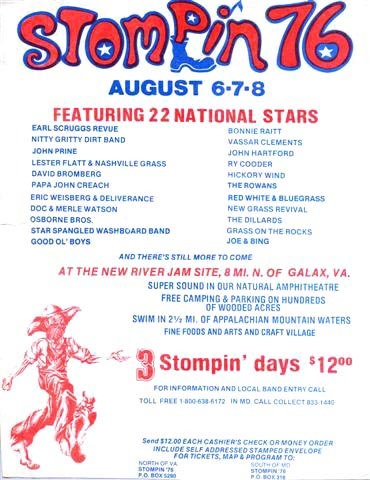 Stompin 76 was the bluegrass festival that made bluegrass cool and exposed it to an entire eastern nation's youth that year. The T-shirts list everyone one of these bands on the back. 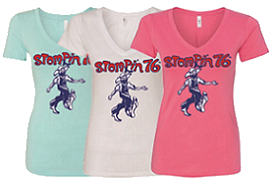 Wear it to your favorite music festival and we'll guarantee you'll make new friends.Stompers are everywhere! Boyd Lawson's 425 acre farm was the historic site for the event. Thanks to his hospitality and the kindness of his wife, their land will live in infamy. Located off Route 58 about 8 miles North of Galax. 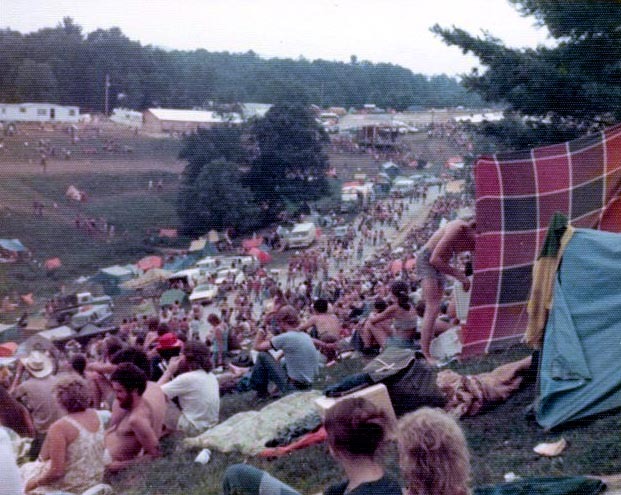 "Long long ago, my husband (who was then my boyfriend) and myself, and his brother and bro's girl went to a music festival in the mountains of Virginia. We had forgotten to bring the tent poles, so I went to the woods nearby to get branches, to which we tied the tent. Having no camera with me, I just had to draw a pic of the place. 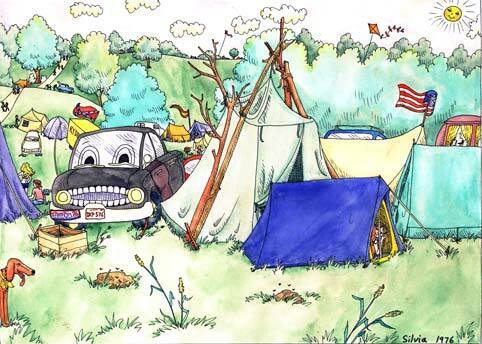 That's me in the little tent. Everyone was camped in this big cow pasture, and there was a great festival atmosphere going on." 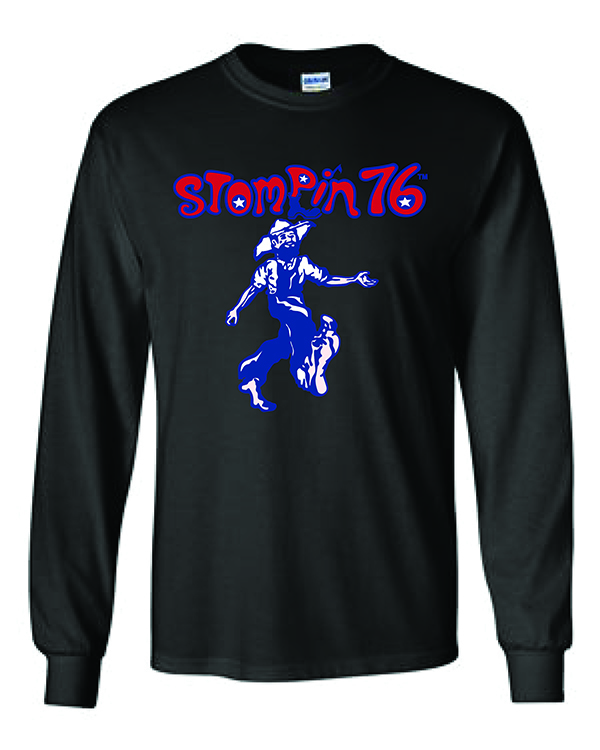 Stompin 76 is a registered trademark owned by Hal, 1976 - 2018. All rights reserved. 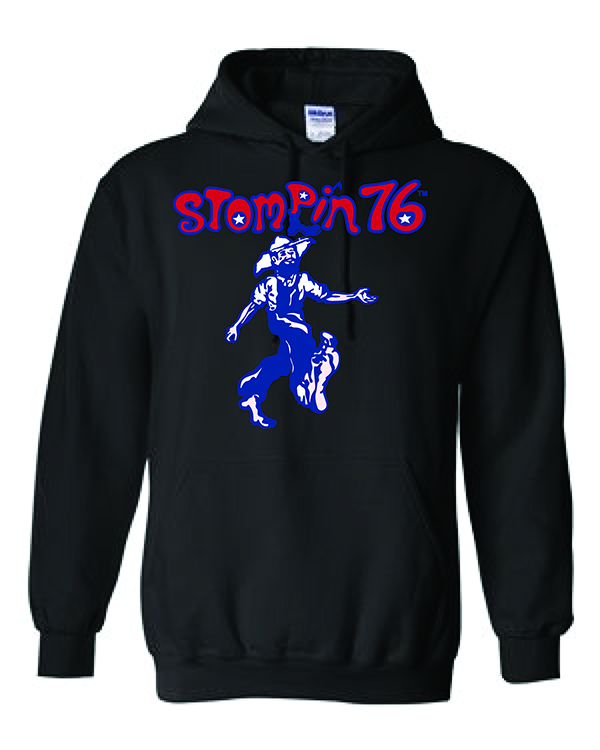 Use of name logo or Stompin character, or reproduction of, is strictly prohibited.